Life can be complex, and most of us have many roles to play and responsibilities to carry. Keeping yourself going, not to mention creating a life you love, can take incredible effort and require delicate balance. Those of us here at MyDailyDosha hold a clear mission in our hearts: To help the practice of Ayurveda come alive for you, so that Nature Herself becomes your greatest ally and strongest support in your journey toward a healthy and happy life. We want to see you thrive- in your work, your play, your love, and your family- and hope to see you upheld as you create the life you want to live. We trust that the healing power of Ayurveda can enliven your body and world because we have experienced this ourselves. In fact, we have committed to passionately practicing Ayurveda like our health and sanity depend upon it- because we have found that they do. Because we are on this broad path ourselves, we can hold your hand with deep understanding through transitional moments and challenge that may arise, with our gaze firmly fixed in the direction you want to go. We know this work, though simple, can be far from easy, especially in moments where lifelong habits are being dismantled and transformed into ways of living that will bring greater personal sustainability. 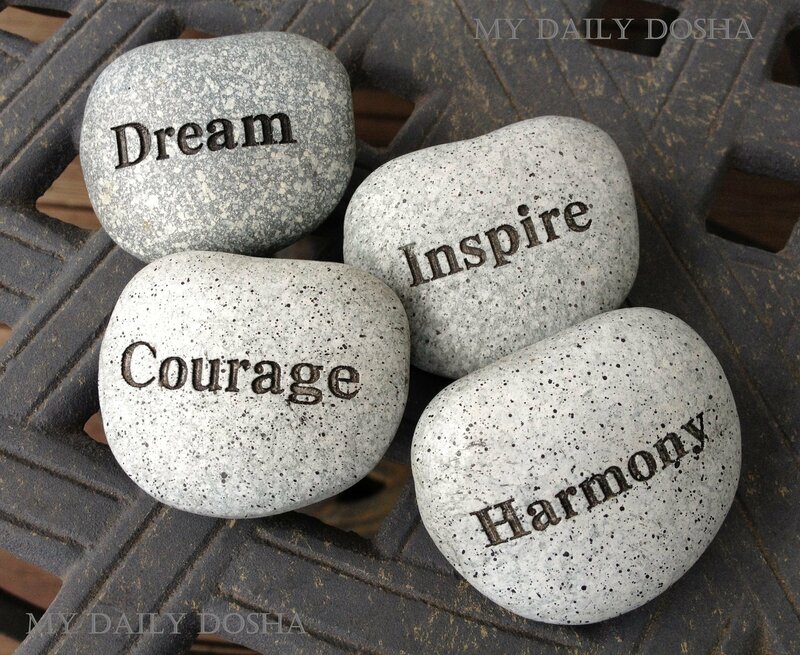 MyDailyDosha offers you accountability: a chance to take inventory each day with Ayurvedic quizzes to determine how your Dosha are moving in response to your actions and activities, all those things that make up your life, from how you eat to how you sleep. Every day offers a new opportunity to put the principles of Ayurveda to practice- to stabilize, to soothe, to energize your entire being physically, mentally, emotionally, and spiritually. Each day gives possibilities to bring healing toward whatever ails and become more fully alive. Ultimately you are the only one who can bring balance to your life and decide to take action to align with what is healthy for you, but we are here to offer friendly support, structure, and guidance. We share educational content to continually re-inspire your personal practice and increase the potential of your food, your movement, and your daily rituals to help you align with your health goals and move your life in the direction you want to go. We can help you amp up your Ayurvedic cooking skills, teach you how to work with healing plants and spices, and bring elemental balancing techniques to your daily yoga or fitness practice. We strive to teach you how to truly nourish yourself on a daily basis, rather than “spoon-feed” you some solution that keeps you dependent upon outside care and intermittent therapeutic treatments. Life is complicated, and we know much can be required of you. We want to help simplify what can sustain you through all your joys and challenges, so you can show up fully and rise to meet all that you love and all that you serve.